What better way to signal the start of a new journey than with an 8 mile hike through a canyon? Last week, One Spark Academy opened its doors to a handful of bright, creative and motivated students…and equally motivated and excited teachers! Four days of lessons and, in a sense, what seemed like private tutoring, was combined with downtime in the game room playing pool and in the gym playing dodgeball. For lunch, we sat down together and enjoyed a healthy meal each day courtesy of Laura’s amazing menu planning and culinary prepping skills. The productivity was so high, the concentration so apparent, that very little independent work (if any!) was needed to be done at home. 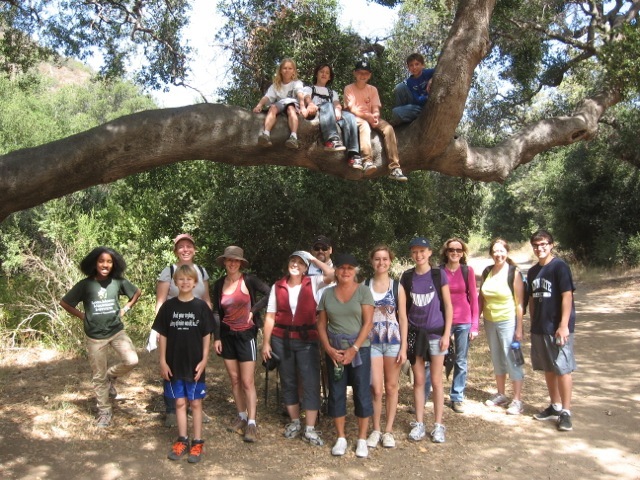 On Friday, our “off day”, 16 of us gathered to walk to Sycamore Beach from Newbury Park, including six of our One Spark students. What a perfect ending to our week of health, new friends, and learning! We would find a new spark in the beauty of the outdoors. As we came to the start of the canyon, the marine layer broke and Boney Mountain blessed us with her majestic visage. Down into the canyon we journeyed, along the way seeing splendid examples of mother nature: a coyote searching for its morning meal, deer casually eating from trees, nests and homes for critters, a snake’s path across a trail, and many black hooded parakeets that have made Sycamore Canyon their home. A recent graduate from Westlake High joined us en route (good timing for him! ), as well as extended family members and friends. For one family member, it would be her last memory of California for a while, as she was boarding a plane bound for home- Australia- that night. After 3 hours, we arrived at Sycamore Cove, its marine layer thick again and the surf pounding. Our journey was rewarded by a chance to relax and enjoy lunch on the beach, while basking in the refreshing sea air and watching the waves of high tide crash amazingly close to the tables. After a while, we loaded up into our caravan (thanks drivers!) and drove back home, feeling wonderfully alive and rested!